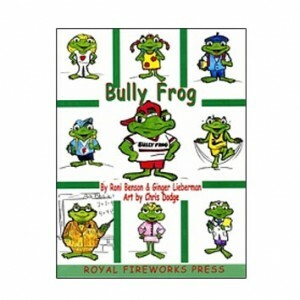 Bully Frog is the story of young frogs in the town of Lily Pond during their first days of school in Leapfrog Elementary School. Bully Frog wreaks havoc on the lives of two youngsters and soon the adults step in to help remedy the situation. But it is basically the students who must solve the problem by becoming pro-active about caring, acting responsibly and being inclusive. Winner 2004 Legacy Book Award for outstanding book from the Texas Association for the Gifted and Talented.